As you can see, bel canto is popular at the Met under Peter Gelb. Since La Cenerentola was originally mounted for Cecilia Bartoli, it is only fair to recommend her version. She is young and lively in this film. All the rest are from HD performances which are probably over represented here. 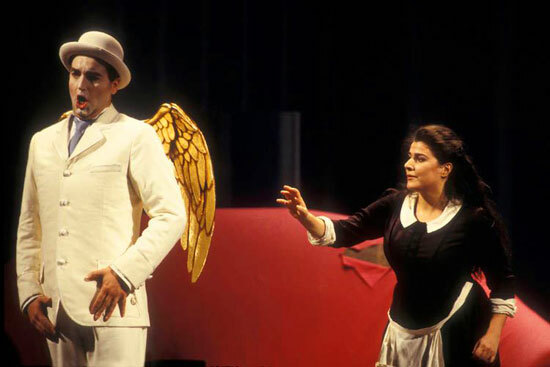 The most famous of the operas from this repertoire are the four comedies Il Barbiere di Siviglia (Joyce DiDonato), L'Elisir d'amore (Anna Netrebko), La fille du régiment (Natalie Dessay) and Don Pasquale (Anna Netrebko), plus the ever popular serious opera Lucia di Lammermoor. This Barber of Seville with Joyce DiDonato and Juan Diego Flórez is good but unusual, because it includes the big aria from La Cenerentola at the end sung by Juan Diego. It becomes his opera. It is a good teaching version if you remember that you won't see this aria in other performances of the same opera. For both Netrebko comedies she is at her peak for this genre. Best of all the comedies is Natalie's Daughter of the Regiment, which is simply exquisite. If you can't get enough of bel canto comedies, then by all means try Le Comte Ory. For Lucia di Lammermoor I have chosen the wonderful performance with Natalie Dessay. It is perfection both for singing and for acting. No one does mad scenes like Natalie. There is rather more serious bel canto in the rest of the list than is generally seen. Plunge in anywhere, but I preferred La Donna del Lago with Joyce DiDonato. Anna Bolena, Maria Stuarda and Roberto Devereux form a kind of unofficial trio of operas called the Three Queens. The list does not yet include the magnificent Norma of Sondra Radvanovsky. Bel canto means beautiful singing and is applied specifically to Italian opera in the early nineteenth century. In the bel canto, especially the serious bel canto, the aria still reigns supreme. Perhaps this explains the popularity of the comedies which often include simpler songs and greater emphasis on acting. How is one to choose? Verdi is the most important composer in the history of opera. This is the Met archive, so I have tried to choose those performances that are the best. To be honest really good Verdi is hard to find. From the HD performances I loved Netrebko's Il Trovatore and the wonderful Falstaff. I can't pick between Netrebko and Guleghina in Macbeth. You choose. Rigoletto is OK but comes in a somewhat bizarre modern production. Spoiler alert: Gilda dies in the trunk of a car. If you enjoy modern productions, by all means see this one. From before HD I have chosen the spectacular Ernani with Lucciano Pavarotti. One really must hear Pavarotti in his prime. We have examples of Placido Domingo from both his tenor and his baritone phases. Remember many people consider him the finest operatic tenor of all time. In Nabucco in HD he is a baritone. This is not in bold, so you may skip it for later. In La Traviata and Otello he is a tenor. Otello is considered his finest achievement and a must see. I have included two operas which starred the great Leontyne Price: La Forza del Destino and Aida. It is important to be familiar with her work, though these are from the end of her career. Verdi is bel canto with heavier singing, heavier orchestration and stronger dramatic elements. He requires heavier voices that retain some flexibility, which can be hard to find. He is often writing about European politics. From the HD performances I have chosen only Tannhäuser in a very old fashioned production, Tristan und Isolde in a fairly modern production with Nina Stemme, and Parsifal in a modern production with Jonas Kaufmann. All of the singers in this Parsifal are outstanding. I omitted other versions of Tristan because I hate the production. If you have the time, you should definitely view The Ring cycle (Das Rheingold, Die Walküre, Siegfried and Die Götterdämmerung) from 1989-90. I did not choose the Ring with the giant log machine because it should not be your first Ring. Some people love it, but I prefer the Wotan of James Morris. I also prefer his Meistersinger. 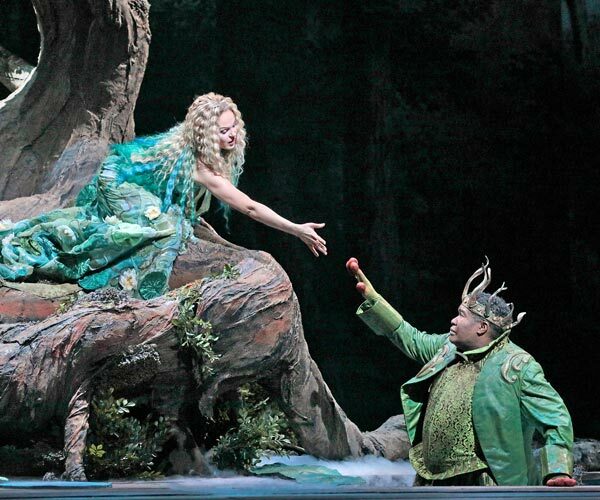 However, you should not miss the Siegfried of Jay Hunter Morris that is in the more recent Ring..
Wagner starts out much like French grand opera, but gradually eliminates the subdivision of opera into preludes, arias and recitatives to create a ceaseless stream of floating harmonies that only stop when the curtain falls. These can seem painfully long, or you will be swept up in the drama, and it will fly by. Don't hesitate to break your viewing into digestible segments even though he doesn't help with this. Orchestration also becomes heavier here in keeping with trends in France. That's in case you thought he invented it himself. Here the emphasis shifts back to HD performances since there is so much to choose from. There is only one film of Pique Dame, and it is pre-HD. There is also only one Samson and Delilah from before HD, but with Domingo and Borodina it has the perfect cast for this opera. The riches from the HD period for this group of operas is astounding. We even have three versions of Eugene Onegin in two different productions. I have chosen the Hvorostovsky/Fleming performance, but you may prefer one with Netrebko. All three are marvelous. 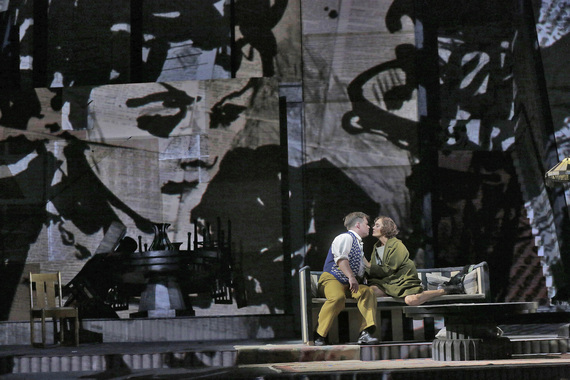 We have two versions of Les Troyens, one from the 80s with Domingo and the other in HD in 2013 with Susan Graham. If I were you I would watch both even though it's a huge opera. Both are wonderful. The expansion of orchestration in the nineteenth century was led by Hector Berlioz and is on display here. 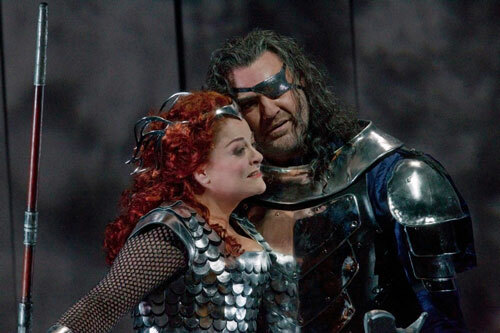 For me the best of the French HD after Les Troyens are Carmen with Elina Garanča (it might be the best Carmen ever), a beautiful Werther also with Jonas Kaufmann, and Les contes d'Hoffmann with Vittorio Grigolo whose manic acting suits Hoffmann. This is a great period of opera with many beautiful performances, but I prefer a different Manon. 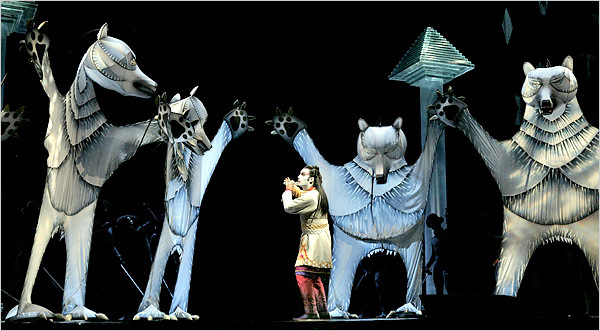 French opera distinguishes itself from German and Italian by almost always including ballet. This goes all the way back to Louis XIV and perhaps earlier. Nothing is bolded. You should see The Bartered Bride because Lucia Popp is singing. This Die Fledermaus features Kiri Te Kanawa. Opera remained popular in Italy after Verdi, but the musical style changed to something more legato with virtually no coloratura. The plots are usually but not always concerned with ordinary people. We have a few operas in our list from before HD, generally featuring Pavarotti (La Bohème, Andrea Chenier) and Domingo (La Fanciulla del West, Manon Lescaut, Francesca da Rimini). It is important to see these great artists in their prime. Some important performances from the HD series are Patricia Racette's Madama Butterfly, and Angela Gheorghiu's La Rondine. For Turandot you may choose from Nina Stemme, Maria Guleghina and Eva Marton. All are excellent. This group is usually the most popular with newcomers, so you may wish to begin here. There are certainly many wonderful performances to choose from. These operas follow the lead of Wagner and transition smoothly from one section to another, a practice that is called through-composed. In the past there have been many wonderful Strauss performances. If you love Kiri Te Kanawa, you will want to see her Arabella and Der Rosenkavalier. If you love Renee Fleming, you have two versions of Der Rosenkavalier to choose from plus Capriccio. I have chosen the Ariadne with Jessye Norman and Kathleen Battle. And I enjoyed Nina Stemme's Elektra. I wish there were more Strauss examples. 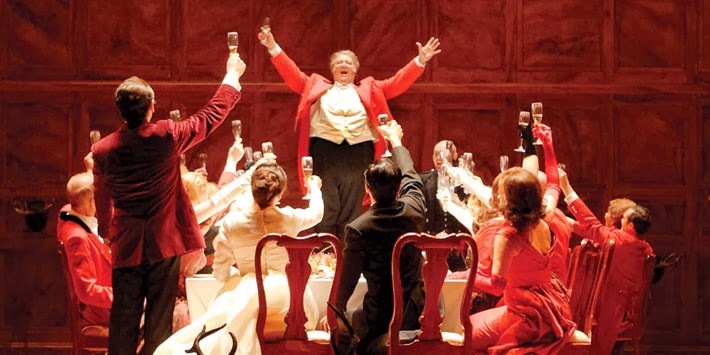 Strauss operas are filled with lush orchestration, a love for the soprano voice and occasionally talky vocal lines. The further we get from Puccini the slimmer the pickings. One of the greatest twentieth century operas in a fabulous performance featuring Jessye Norman and Regine Crespin is Poulenc's Dialogues of the Carmelites. It's very serious but very much worth it. But if you don't like serious, what are you doing here? The HD productions for The Nose and Lulu are more themselves art objects to be admired than they are theatrical performances. The visual riches distract from the story. Maybe you would enjoy them. I recommend Teresa Stratas for Weill and Corigliano. She is completely charming. From the HD series I very much enjoyed the Bluebeard's Castle. We would need to discuss this whole area of repertoire to get an idea of what would interest you. The DVD selections not from the Met are far more representative. 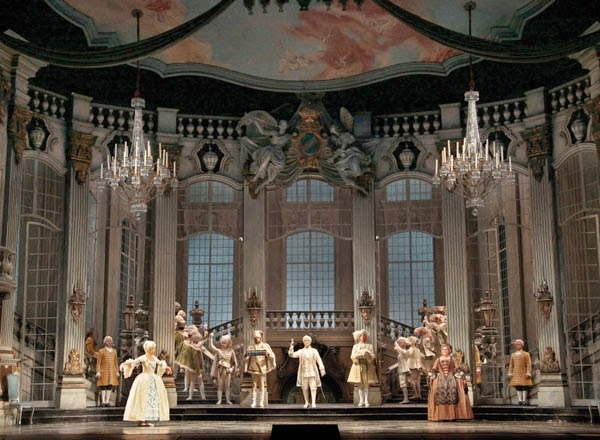 This guide is intended to give insight into the riches on the website of the Metropolitan Opera. A few of these are listed in Met futures. In 2019-2020 they show new productions for Glass’s Akhnaten, Wagner's Der Fliegende Holländer, Gershwin's Porgy and Bess and Berg's Wozzeck. No Janáček.